Describing Jews as “apes” and Christians as “swine,” the middle-school and high-school books command death for apostates from Islam. 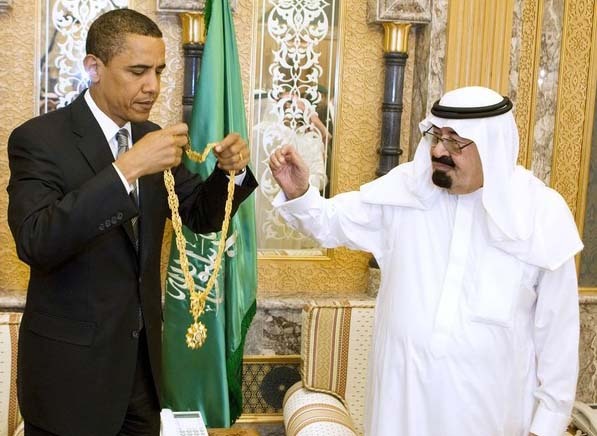 The Saudi King gives an Islamic medal of honor to a "Christian swine", if its true that Obama is a Christian. A new report shows that Saudi Arabia, home to 15 of the 19 terrorist hijackers of 9/11, continues to promote a violent form of Islam through its school system and textbooks 10 years after the attacks. “The Saudi government has given over its textbooks to the clerical Wahhabi extremists that it partners with to maintain control of the country,” said Nina Shea, director of the Hudson Institute’s Center for Religious Freedom, in a Sept. 13 interview with CNA. While describing Jews as “apes” and Christians as “swine,” the middle-school and high-school books command death for apostates from Islam, while encouraging violence against non-Muslims who refuse to make a “covenant” or come “under protection” of the Muslims. “In the general usage, Jihad is divided into the following categories: … Wrestling with the unbelievers by calling them (to Islam) and fighting them,” teaches the 12th-grade text “Hadith and Islamic Culture,” used in the 2010-2011 school year by the Kingdom of Saudi Arabia’s Ministry of Education. “Moreover, as the controlling authority of the two holiest shrines of Islam, Saudi Arabia is able to disseminate its religious materials among the millions of Muslims making the hajj each year. Hence, these teachings can have a wide and deep influence,” the report noted. Not all reports that comes out of the Catholic News Agency (CNA) is useless. This one is very useful. It is amazing that Vatican cardinals are saying that Catholics and Muslims worship the same creator “god”. When the Islamic powerhouse of Saudi Arabia keeps on telling its children that “Christians are swine”. There seems to be a lot of double standards out there. It is also known as hypocrisy.